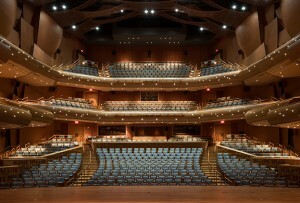 The house of the Musco Center for the Arts, viewed from the stage. The Opening & Preview Season will include internationally acclaimed virtuosos and ensembles that define excellence, as well as the finest Chapman student performances from the University’s nationally recognized College of Performing Arts (CoPA), which encompasses the Hall-Musco Conservatory of Music, the Department of Dance and the Department of Theatre. Kicking things off with a day filled with performances and fun, the Center will throw its doors open to the entire community on Saturday, April 2 with a free Community Open House & Arts Festival from 11 a.m. to 10 p.m. The Open House will include performances on four stages inside and outside the Center, by artists from all over Southern California: musicians, singers, dancers, ensembles and much more, as well as backstage tours, family activities and much more. The day includes a showcase performance by College of Performing Arts soloists and ensembles, as well as a concert by Pacific Symphony. Details will be announced soon. , staged to coincide with the Bard’s 400th birthday, as well as music and dance by The Chapman Orchestra, Opera Chapman and other outstanding student ensembles.
. Once complete, it will serve as a new cultural beacon for campus life and the broader community, giving notice that world‑class arts education and artistic achievement have found a new home in Southern California. Grand Opening – SOLD OUT! Chapman University celebrates the Grand Opening of the Marybelle and Sebastian P. Musco Center for the Arts with a historic all-star performance. SOLD OUT. Piano and voice combine in American master Charles Ives’ magisterial work that evokes the spirit of Concord, Massachusetts and the icons who gave it its literary crown – Ralph Waldo Emerson and Henry David Thoreau. Hailed at its 1939 premiere as “the greatest music composed by an American.” Curated by Pacific Symphony as part of the Interplay 2016 festival, presented in partnership with Musco Center and Chapman University. General Admission: $20. Non-Chapman Students: $15. Chapman Students/Faculty/Staff with ID: $10. Reserved Tickets: $20-$35. Student Discount – $10 off (any level) with ID. Shakespeare’s immortal story of deceit, prejudice and justice is searingly portrayed in this new production directed by Chapman’s own Thomas Bradac, and starring acclaimed Shakespearean actor/Chapman theatre professor Michael Nehring as Shylock. Reserved Tickets: $10-$25. Student Reserved Tickets: $10 (all levels) with ID. Experience the blazing virtuosity of one of the world’s finest young pianists, the Kiev-born winner of the 2013 Van Cliburn Piano Competition. Reserved Tickets: $20-$45. Student Discount – $10 off (any level) with ID. High-flying innovation from some of California’s top contemporary dance companies, including Whyteberg, TheFyberVision, Los Angeles Contemporary Dance Company, Backhausdance and Blythe Barton Dance. Reserved tickets $10-$25. Student Reserved Tickets $10 (any level) with ID. Christopher Nicholas conducts this gifted ensemble of more than 40 student performers in an eclectic repertoire ranging from classical masterworks to contemporary pieces. Program to be announced. General Admission: $15. Non-Chapman students: $10. Chapman students/faculty/staff with ID: $5. The Emmy-winning Animal Planet host, author and biologist speaks eloquently and entertainingly on the conservation of endangered species and ecosystems across the globe. Reserved Tickets: $30-$65. Student Discount – $10 off (any level) with ID. Chapman’s Thompson Policy Institute on Disability and Autism offers the results of its first year of research in clear, unbiased findings. Free and open to the public. Made up of stellar musicians who played with late jazz legend Kenton, this swingin’ ensemble joins the Chapman Big Band & Jazz Combo for an evening for an evening of music that’s anything but square! Two-time Grammy nominee Rod Gilfry, one of the true “heartthrobs” of the opera stage, performs a recital ranging from operatic arias to the best of the musical-theatre songbook. Experience an evening of original work created by select dance majors and technologists. This first-of-its-kind collaboration course, co-taught by Professors Don and Alicia Guy, will include a post-show talk-back with the student creators and special guests from Cirque du Soleil, discussing the collaborative process and providing a behind-the-scenes look. Admission is free and open to the public; no reservations required. With nearly 100 top student performers on stage, the Hall-Musco Conservatory of Music pulls out all the stops for this annual concert spotlighting the combined forces of The Chapman Orchestra and Chapman Choirs. and Beethoven’s Symphony No. 5. General Admission: $10. $5 students and seniors. most beloved stars, David Archuleta, plus superstar interfaith speaker Valarie Kaur. Featuring inspirational messages of faith for all graduates, whether secular, spiritual or religious. Open to all: graduates, their families and the public. Free admission. It’s fiesta time in the Aitken Arts Plaza! Enjoy free activities and performances saluting the glorious music and culture of Mexico on the Plaza all afternoon, followed by an evening concert featuring two of Southern California’s most acclaimed mariachis. Presented in association with the Chapman University Latino Staff & Faculty Forum. Reserved tickets for 6 p.m. concert: $20-$35. Student discount: $10 off (any level) with ID.